Destoroyah, a mutation derivative of the Oxygen Destroyer used in 1954 on the original Godzilla and the last foe of the Heisei era, joins the S.H.MonsterArts line! I was excited when Destoroyah was announced as I do not own any figures of it. There are different figures of the kaiju on the market, but none do it justice when it comes to screen accuracy. Priced at a whopping $150, surpassing King Ghidorah’s $124 price point, Destoroyah was the largest figure of past released S.H.MonsterArts. Despite the beauty of the figure, it does have some controversial points like the color of its eyes, its wing design, and its lack of accessories. With that in mind, does Destoroyah live up to its hefty price point? Sculptor Shinichi Wakasa graces the S.H.MonsterArts line with a fantastic,screen accurate sculpt. Destoroyah features ABS and PVC parts that create an incredibly detailed beast. Destoroyah’s face is a good example of this. Like King Ghidorah, just about every figure on the market today doesn’t seem to capture the monster’s face properly. The face on this figure could not be any more accurate to its movie screen counterpart. It’s beautifully detailed with crevices and veins. The horn on its head is made of a translucent material so it glows when light shines through it. Destoroyah’s head crest shield is also full of bumps, rivets, and crevices accentuating its detail with a non-consistent pattern which makes it look weathered, but in a good way. The eyes are a translucent red rather than yellow as in the film. It’s odd because even the box art shows Destoroyah with its eyes properly colored yellow, so why the aesthetic change? At the time this is written, no one knows, but I have a theory that it may be based off what the suit’s eyes looked like when the eyes weren’t glowing. Either way, it detracts from its signature evil gaze and, instead of a menacing look, the eyes blend with the rest of the head’s design, making it hard to see if it really has eyes to begin with. The neck, arms, and wing frame retain the crustacean elements found in Destoroyah’s previous forms. These elements are designed not only to have meticulous detail, but also to allow light refraction to enhance the crustacean-like structure. The claw fingers feature a sharp and jagged look instead of a perfect smooth spherical shape. The shoulders are big and bulky, featuring two big horns on the tips and three smaller horns around the big one. It reminds me of what medieval warriors would wear before they were to embark on a quest with heavy armor. The chest features a similar pattern found on Destoroyah’s previous forms which seems to be a defining characteristic for Destoroyah. It looks like a segmented apple pie, but in armor form. The legs are designed with more elements of armor, rather than the crustacean material, specifically around the knee caps. Each knee features nine horns, three of which are medium sized and six which are much smaller. While the legs don’t share the crustacean qualities, they still have a reflective coat. The feet are huge and feature three toe claws, two smaller horns above these, and another toe claw on the rear of the foot to provide plenty of stability for this massive figure. Needless to say, Destoroyah looks like it could take the hardest of hits and barely flinch. Destoroyah has a total of four wings, two large ones for flight and two smaller ones beneath the larger ones. The bigger wings are detailed with lines and rivets, creating a more bat/demon-like wingspan. Instead of segmenting the wings with hinges, (as featured in Fire Rodan’s design), the wings have been segmented as individual parts attached to tiny ball joints. It seems like it was done for articulation purposes. Depending on how the wings are positioned, it can look really ugly and unnatural or fantastic and daunting. By keeping the individual segments close together, the wings can be posed in a neutral position similarly to its movie screen form. From a distance it’s not too bad, maybe even unnoticeable, but up close it may bother some collectors. I don’t think it’s the greatest design decision, but it’s better than King Ghidorah’s. The back side is layered with horned plates that run from the neck all the way down to the tip of the tail. It’s excellently detailed and consistent. The tip of the tail forms a pincer that has sharp linear edges. Overall, the design is spot on with the exception of the eye color and the weird wing design. At least the wings can be adjusted to look right. At first glance, Destoroyah looks like a bulky stiff statue. Thankfully, that’s not the case as the articulation is surprisingly implemented very well. Without sacrificing the sculpt with articulation seams, Destoroyah can perform basic movements as well as extreme poses. The wing joint system is far better than King Ghidorah’s double hinge joint design and now uses a new ball joint and peg system. The pegs offer a new way to secure ball joint movements as well as offer a better range of motion. The head can twist left to right and tilt up and down with ease. Twisting is extreme in both directions and the figure can perform a “cockeyed” look. Tilting down is extremely limited while tilting up is the opposite. The neck and head joints allow tilting the head up at a 90 degree angle, perfect for Destoroyah bellowing into the air and for flight poses. The mouth opens and shuts as expected. WARNING: When moving Destoroyah’s head, hold it by the crest and NOT the horn. The horn is made of soft ABS and will rip off if too much pressure is applied. The torso has very limited movement. There’s no way to tilt up or down and it’s tough to rotate left or right due to the figure’s massive build. It can rotate a smidge though with the proper amount of force. Honestly, even when the torso is rotated to its max potential, it really doesn’t add anything to the pose. You’d be better off not moving it as too much pressure will pop off the midsection. The arms are a mixed bag of tricks. They can bend, rotate, and tilt, but the direction and uniformity are a mess. Destoroyah’s arms don’t have a traditional muscle structure and instead are comprised of crustacean armor. Sometimes these segments can be rotated too much and the arms don’t pose right. It takes a good eye to figure out how to put those segments back into the proper rotation so that the arms may again bend correctly. The shoulders are attached to a ball joint and peg system allowing for optimal tilting and rotation. A new feature implemented in Destoroyah’s hands is the claw/finger articulation. Each claw is able to move, allowing for various poses. It makes sense since Destoroyah only has three big claws and the parts aren’t small enough to break easily. The wrists are able to rotate in a 360 degree motion as well as tilt up and down or whichever way the wrists are positioned. The wings are a fresh breath of air after the controversial wing design of King Ghidorah. These wings are fantastic and are able to rotate in a 360 motion, just like a bat’s. 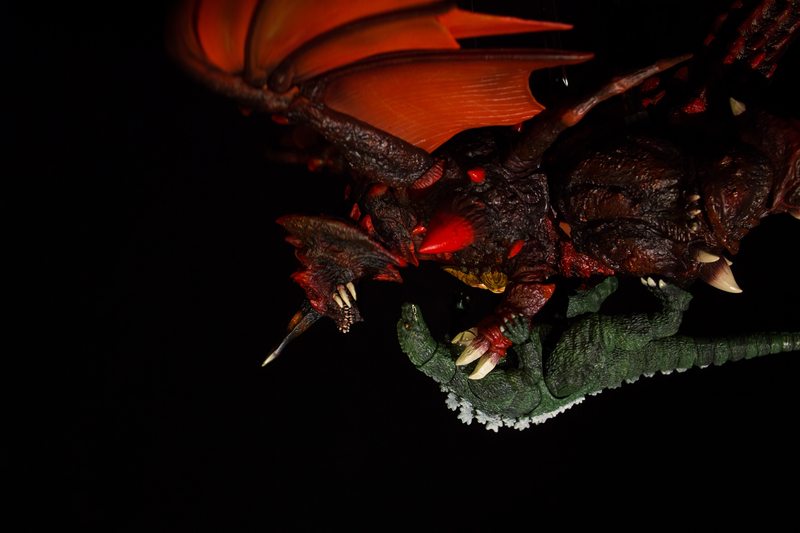 The base of the wings are connected similarly to Fire Rodan’s ball joint system, but feature a long peg with a ball joint at the tip. This allows for an amazing amount of motion as well as a very secure mount for the wings. Halfway through the wing’s frame is a point of articulation allowing more movement for the tip-half of the wing. The membrane is sectioned into parts and are attached by tiny ball joints to the wing’s frame. This allows the wings to extend and contract, which is useful for a flight pose. It does look messy at first glance, but after adjustments the wings can look fantastically dramatic. I think for future winged creatures they should stick to a system like Rodan’s membrane with tiny hinges or King Ghidorah’s solid sheet of plastic. For me, this articulation system isn’t bad, but it doesn’t look aesthetically pleasing up close. In addition, the two smaller wings on the back are able to rotate in a 360 degree motion and slightly tilt in any direction. Destoroyah never had much movement in the film, as it hardly walked. Surprisingly the legs and feet have an awesome amount of articulation. The legs can almost rotate 360 degrees. Alternately, Destoroyah can bend over and touch its face to the ground. Doing this can replicate Destoroyah’s Horn Katana attack. Above the thighs and next to the waist, the legs have a joint that is able spread the legs widely to create a grounded attack stance. The feet can also rotate left to right and slightly tilt up and down. This comes in handy for flight poses. The tail’s articulation doesn’t have the best range of motion, but it works well for Destoroyah’s design. Part of the issue is that Destoroyah’s tail starts really big and thick and gets thinner toward the tip. Where it’s thick, the tail is pretty stiff, but as it gets thinner, the range of motion becomes fantastic. The eleven articulation segments go all the way to the tip of the tail where even the pincer is articulated. The pincer can open and shut, although it’s delicately held in place by small ball joints, so care is needed. Overall, even though it has small nuisances, the articulation for this figure is more of a pleasant surprise than a horrified mess and it allows for some really awesome poses. Destoroyah is the first figure of the line to not include any accessories. The only thing I would have hoped for was a beam effect or maybe even a Horn Katana effect part. Tamashii has gone on record saying that the effects parts for the S.H.MonsterArts line were only meant for the first few waves and that, due to costs and keeping the figures at a reasonable price point for consumers, they’ve opted to no longer include them except for special cases like Mecha units. Destoroyah is a magnificent figure. This is the closest representation on the market to its film counterpart. The new ball joint and peg system really works well, securing joints and allowing a greater range of articulation. It was also refreshing not to see a repeat of King Ghidorah’s wing design. The paint was phenomenal and the articulation was surprisingly advanced for a monster that hardly moved in the first place. Its price tag may deter some collectors, but in time it should decrease. I would wait until the figure is between $80 and $100. If you don’t own a figure of Destoroyah or are looking for a screen accurate version, then this is the figure for you. Is it a must have? Yes. Do I recommend Destoroyah? Yes. The paint job is phenomenal. Many different shades of red, black, brown, yellow, orange, and a little purple create the perfect look. The body is mostly red, brown, and black. The blending tends to stay mostly on the darker side. The face has small purplish veins on its snout mixed with blended black and red colors. The teeth and tusks are a yellowish-white color and blended perfectly. The inside of the mouth is a mixture of different shades of red. The eyes are red, although in the film they were yellow. The horn is a blend of yellow, orange, and black. The chest pattern is comprised mostly of yellow, brown, and orange markings. The back of Destoroyah is predominantly red and black and no other colors. This pattern runs all the way down to the tip of the tail. Essentially, the edges of the figure’s hide are red while the inner parts are the darker blended colors. All of the claws and horns are the same color as the yellowish-white teeth. The wings are mostly a lighter red color with blending of black and browns to emulate a better membrane color. The same goes for the smaller wings. With the exception of the color of the eyes, the overall paint job is executed well and stays true to its screen counterpart.